In case you needed any. In case you needed more proof the Model S is the quickest stock sedan in the world, both DragTimes and a guy named Chris recently posted videos of a Tesla Model S P100D putting its Ludicrous + mode to the test by setting record quarter-mile runs. According to electrek, the quarter-mile runs took place within a day of each other. 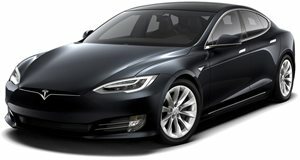 Ludicrous + was introduced with Tesla’s Software v8.0 release. More acceleration is achieved by sacrificing gearbox and battery longevitity. Prior to launch, it also cools the motors using the car’s a/c and heats the battery to optimal temperatures. In the DragTimes video, the P100D went up against a modified Camaro ZL1 and BMW 550i, setting a record time of 10.723 seconds, at the Pam Beach International Raceway in Jupiter, Florida. Quarter mile times have been steadily improving with every new iteration of the Model S: 12.3 seconds (P85), 11.6 seconds (P85D), 11.2 seconds (P90D Ludicrous Mode), 10.7 seconds (P100D Ludicrous Mode) and now 10.6 seconds (P100D Ludicrous+ Mode). Whether the next-generation Tesla Roadster will beat that time with its “Maximum Plaid” acceleration mode remains to be seen.